A woman has been jailed for life after beating and blinding her 11-month-old son who she then murdered. Callum Wilson, from Windsor, suffered a detached retina, an "unsurvivable brain injury", broken bones and bruising, and died in hospital in March 2011. Emma Wilson, 25, of Paddock Close, had blamed the injuries on Callum's "boisterous" older brother. She was sentenced to life with a minimum of 14 years, at the Old Bailey in London. Wilson was convicted of murder in December after she was unanimously found guilty by a jury following a five-week trial at the same court. Wilson became pregnant in 2009 after a relationship with Lee Workman, who was unaware he was the father, prosecutor Paul Dunkels QC said during the trial. As with her first child, Wilson showed no physical signs of pregnancy and was able to keep Callum's birth a secret. The court heard her then-partner, who cannot be named for legal reasons, had insisted Callum be put up for adoption, something Wilson "deeply regretted". Callum was born on 23 April 2010 and spent the first few months of his life with foster parents. In November 2010 he was returned to his mother, but on 18 March 2011 he was taken by ambulance to Wexham Park Hospital in Slough suffering serious injuries. Following medical tests he was taken to the John Radcliffe Hospital in Oxford, where he died on 21 March. The infant was found with a brain injury, rib, arm and leg fractures and bruising across his face and body. During Wilson's trial, Mr Dunkels told the jury she had claimed "constant pushing and rolling" of Callum by his then 23-month-old brother may have been to blame for the injuries. He added: "But he could not have fractured Callum's ribs, which was consistent with violent squeezing of Callum's chest." She also blamed Callum's brother after health and social workers spotted scratches on him during visits to Wilson's flat, the jury was told. The court heard Wilson also lied to staff and parents at a playgroup in Maidenhead, claiming Callum was her cousin's son. She provided a false surname and address for the youngster and claimed on one occasion that bruising on Callum's face had been caused by an older sister who in fact did not exist, prosecutor Paul Dunkels said. 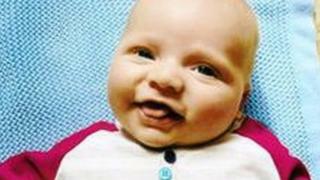 Staff noticed Callum change from a "happy, smiling baby" to "emotionless and listless", he added. Photographs were shown to the jury of Callum with visible bruising to his face. The Crown Prosecution Service said at least one picture was taken by Wilson of her with Callum in the background, but there was no evidence to suggest that it was after the baby had died. Mr Dunkels said the prosecution did not believe Wilson intended to kill her son but claimed she carried out "a violent act" against a "vulnerable" child. Following the sentencing, Det Supt Ian Hunter said: "The sentence today is a reflection of the abuse Callum suffered at the hands of someone entrusted to care for him and the pain he must have felt during his short life. "It also reflects on the dedication and efforts of the investigating officers and prosecution team to deliver justice for Callum during what was a difficult and emotional case for many of them. "Of course, sadly it does not bring Callum back and our thoughts will always remain with him." A serious case review report is due to be published by the Royal Borough of Windsor and Maidenhead's Local Safeguarding Children Board in four to six weeks time.